My student teacher has begun preparing for her unit of study. She decided to teach the novel Carrie’s War by Nina Bawden. 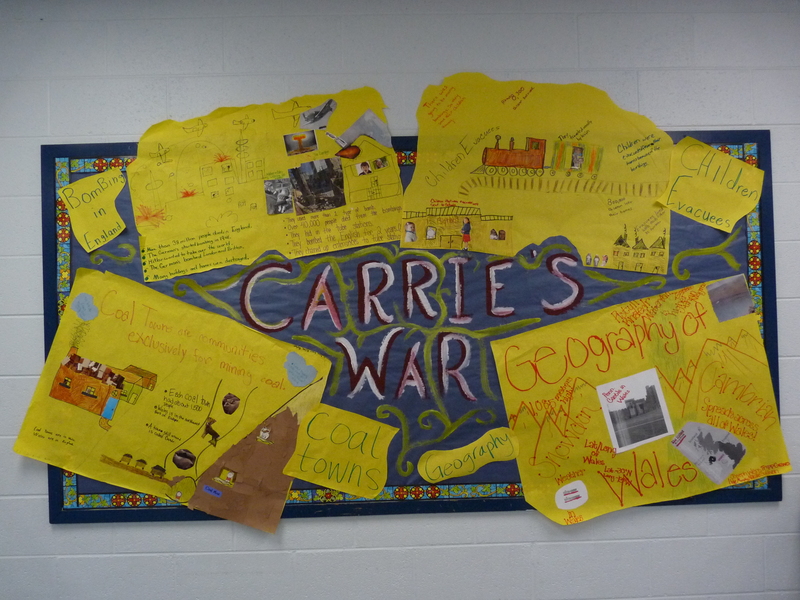 To get the students ready for the novel, she had them do a little research about World War II, Wales, Bombings in England, and Coal Towns. Before they researched, she had them create a KWL chart. The students filled out what they knew about WWII in the K column. They discussed what they knew as a class. Students were then grouped and they decided what topic they wanted to research. As a group they were to come up with 5 questions to research in their W column. The students were then given time to research their answers and fill in the L column. I did this same activity with the novel Lily’s Crossing. I like it because it gives the students ownership of their learning. My students then had to write a book report using the criteria provided. They could write a newspaper article, radio drama, or a song. I will display their work the board below. 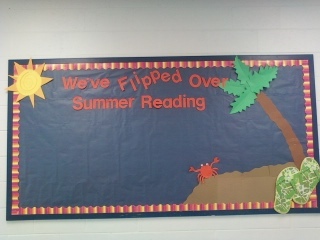 Each student will also decorate their own flip flop to place on the board along with their book report. We also have to have a religious bulletin board. I got this idea on our way to Florida. 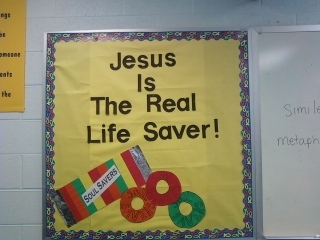 There was a bus that said, ” Jesus is the real lifesaver.” I made my”soulsaver” candies out of construction paper. 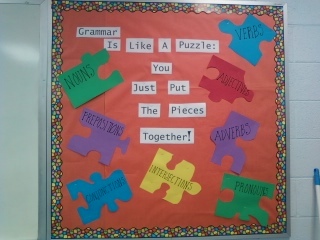 My last bulletin board I got the idea off of the internet. I added more parts of speech than what was shown on the internet. I made the puzzle pieces out of construction paper too. I feel that my bulletin boards look great! I guess tomorrow I will have to get organized and maybe hang some posters! I learned about graffiti walls from my student teacher. It is a simple way to help students understand concepts. To create a graffiti wall you will need a piece of paper. In the center of the paper, draw a circle or any shape. I like to do a squiggly cloud shape. Write the concept in the center of the shape and everything that has to do with that concept. On the outside of the shape, have the students write everything that the concept is NOT. My students and I created a graffiti wall bulletin board on vivid verbs. We added as many vivid verbs to the center. Some verbs we came up with are scampered, casting, stroll, animate, devoured. On the outside of our wall we placed helping verbs, conjunctions, linking verbs, nouns, adverbs, adjectives. Students were then allowed and encouraged to add to the graffiti wall whenever they heard of an excellent vivid verb. I also tweaked this idea by creating a huge idea wall for my students at writing camp this week. I used a huge piece of butcher paper and across the top I placed the headings onomatopoeia, instead of said, adjectives, adverbs, and vivid verbs. I wrote words under each category to start the brainstorming process. When I introduced the wall to my group on Monday, I had them brainstorm aloud and I added words under the category. Throughout this week my students have added words to the wall and have used the words in their writing, which was the goal! I used to like to create bulletin boards, but as the years go by I don’t care for them. I want to do a writer’s bulletin board (maybe what good writer’s do or a community of writers and readers) and I think I might do the Celebrity Writer’s Profile or biographies with my students. I may even do a Crispin theme. (My students read Crispin over the summer) I don’t know. School starts August 20th. Does anyone have any cool bulletin board ideas for 6/7 graders? I am all ears.